Glensaugh is a research farm which extends to 1,000 hectares (ha) and lies in the Grampian foothills to the east of the B974 Fettercairn to Banchory road about 7 km north of Laurencekirk. Glensaugh lies within an altitudinal range of 120 and 450 metres above sea level and has an average annual rainfall of 1040 mm. The Highland Boundary Fault divides the research farm into two distinct geological zones. North of the fault the soils are of the Strichen Association developed on drifts derived from schistose rock: the brown forest soils and podzols of the lower slopes give way to peaty podzols and, on the highest ground, to peat. To the south of the fault the soils are developed on drifts derived from Old Red Sandstone: humus-iron podzols dominate the lower slopes and peaty podzols occur at higher elevations. The research farm comprises 865 hectares (ha) of semi-natural plant communities, 60 ha of predominantly rotational grassland and 88 ha of permanent pasture. On the alluvial soils of the valley bottom the semi-natural vegetation is dominated by species-rich Agrostis-Festuca grassland. This gives way to species-poor Agrostis-Festuca on the lower slopes, with bracken (Pteridium aquilinum) also present. The higher slopes are dry heather (Calluna vulgaris) moor, with blaeberry (Vaccinium myrtillus), wavy hair grass (Deschampsia flexuosa) and bell heather (Erica cinerea) locally important. On the deeper peats at the highest altitude, cross-leaved heather (Erica tetralix) and cotton sedge (Eriophorum vaginatum) become co-dominant. The predominantly rotational grassland is reseeded with perennial ryegrass and white clover mixtures every 7-10 years. This provides grazing for the crossbred ewe flock, swards for experimental work, silage for winter feeding and aftermath grazing for finishing lambs. Glensaugh carries 400 Scottish Blackface ewes (pure bred) and 500 crossbred ewes (mated with Texel and hybrid rams). In addition the farm carries 50 Blue-Grey spring-calving suckler cows (mated with Charolais and Limousin bulls) and 100 red deer breeding hinds. There is housing for 80 cows and calves, 500 ewes and 100 red deer calves. Glensaugh continues to be available for outdoor experiments from plot to field right up to landscape scale. Glensaugh indoor research facilities include 70 individual pens suitable for sheep and goats, and flexible group housing for up to 100 sheep. There is a 300m2 area of flexible group penning suitable for sheep, goats, red deer and cattle. There are three individual rooms with temperature and lighting control which can house up to 12 sheep per room and there are four large animal calorimeter chambers. There are three well-equipped laboratories, including two centrifuges and two fume cupboards. Sample drying facilities are also available on site with a large drying oven within the drying room. There are 2 -18°C walk-in freezers and a 4°C walk-in chill room for short term sample or feed storage. An 18m polytunnel is also available. Meeting rooms and computing facilities are available for use by visitors. Residential accommodation is available on site for those who wish to stay, or who are engaged in longer term research projects. Glensaugh is one of the 11 UK sites in the Environmental Change Network (ECN) . Measurements are being made of the long-term changes in dry and wet aerial deposition, water quality, soil characteristics, vegetation and wildlife. The ECN is sponsored by several UK government departments and agencies and the Scottish Government and its agencies. Read more on the Automatic weather station  and Birnie Burn environmental monitoring  pages. The primary land use activity at Glensaugh is commercial livestock farming which is supported by an extensive grazing resource. In line with industry trends, recent years have seen a reduction in stocking density and a corresponding reduction in purchased inputs. 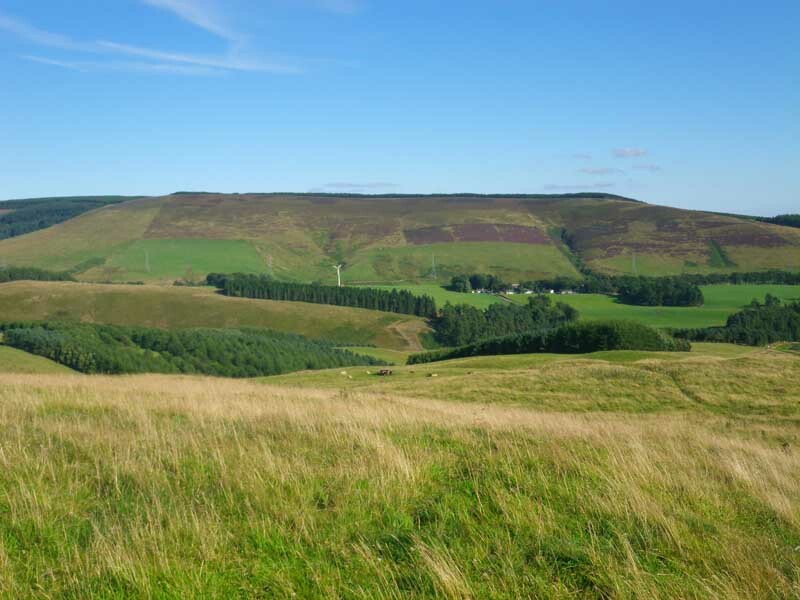 Glensaugh's extensive area of semi-natural moorland is its most valuable resource. This is supported by a small area of intensively managed clover rich leys towards which inputs are carefully targeted. A 50kW wind turbine was commissioned in 2010; this meets part of Glensaugh's electricity requirement. Restoration of the Glensaugh’s private water supply was completed in 2009. A 70kW biomass boiler was commissioned in 2011 to displace LPG as a source of heating fuel. Scotland Rural Development Programme funding has supported the planting of 28 hectares of new woodland, bringing shelter and biodiversity benefits as well as creating a potential fuel source.